Around 6 AM today, December 23 in Manila, Miss Colombia Ariadna Gutierrez congratulated the Filipinos for Pia Wurtzbach's Miss Universe win through a post on her personal Instagram. This is the first public announcement made by the latina beauty queen that recognized her eventual placement as First Runner-up. In a lengthy caption originally written in Spanish and we translated on Google, she wrote: "I want to congratulate all the Filipinos for their new Miss Universe. The joy they must be feeling is huge." American gossip blogger Perez Hilton, who also served as a judge at the coronation night held last Monday, criticized the Colombian beauty queen on morning show "Good Morning America" for two controversial posts on the same Instagram page. Gutierrez posted a photo of her wearing the Miss Universe crown with the caption "Por Siempre Tu Miss Universo! COLOMBIA!!!" or "Forever your Miss Universe, Colombia!" Miss Colombia's congratulatory remarks came 2 days after the pageant ended in a controversial error during the announcement of winners. 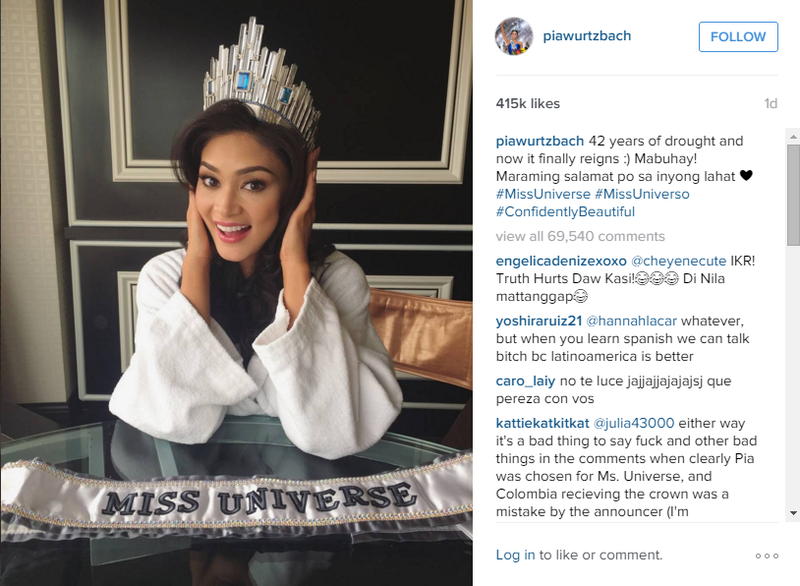 Filipinos took the heat to social media, saying that Pia Wurtzbach wasn't given the chance to fully celebrate her win because of the mixed up. This is the Philippines's first Miss Universe win after 42 years. Also on Instagram, meanwhile, Pia Wurtzbach formally celebrated her first day as the new Miss Universe with a photo of her wearing the crown in her hotel room.